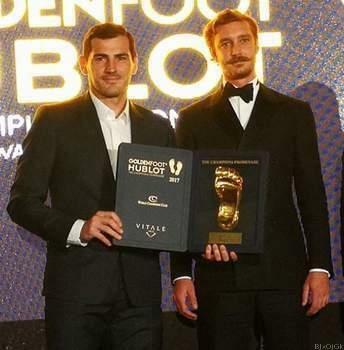 Porto goalkeeper Iker Casillas has been presented with the 2017 Golden Foot award at a ceremony at the Hotel de Paris in Monaco. The award, which is designed to recognise the long-standing achievements of players in terms of both their skills and personality, has been presented since 2003, when Roberto Baggio, then of Brescia, picked up the prize. Winners, who must be at least 28 and still playing, have the honour of leaving a permanent footprint - or in Casillas' case handprint - on Monaco’s ‘Champions Promenade’ along the seafront. The 36-year-old beat off competition from nine other players, including Lionel Messi, Cristiano Ronaldo and Luis Suarez to claim the award. He has a lengthy list of honours to his name after a glorious playing career that has seen him win three Champions Leagues, five Spanish league titles, as well as the World Cup and two European Championships with Spain.